If you guys haven’t followed I totaled my 899 Panigale. A quick update, it has been deemed a complete loss. The shop looked at the water damage and assessed just the electronics damage at $19,000 dollars. They said there is water in the engine but they cannot give an estimate but could range from 3,000 - 10,000 in damage and that’s not including labor. They said low side the bike has $25,000 in total damage to it. I also received the police report and it was determined to be the other drivers fault for blocking both lanes. I went test riding other super bikes but I have the same problem with those as I had with the 899. After weighing in all the options of doing a new Superbike I decided I wanted to go a different route. I’m terrible at wheelies and an expensive fragile bike isn’t the best to learn on. I’ve decided I’m going super moto! 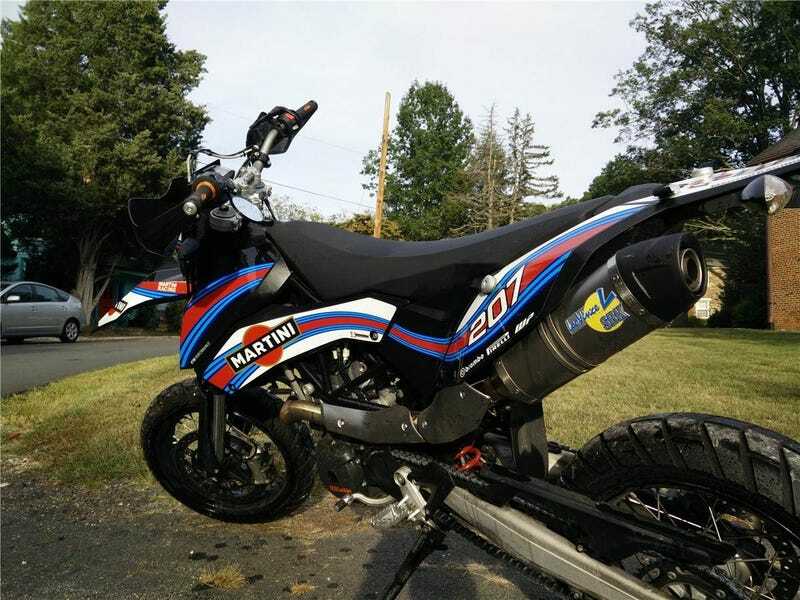 I’ve found a beautiful KTM 690 SMC with Martini plastics and a TON of parts and if everything goes as planned that’s what will be joining my stable, best of all it will be paid for without a loan.